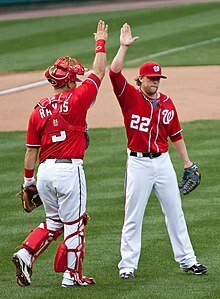 Start-ing Over: Some Thoughts On Drew Storen | How Do I Baseball? It’s never easy to have that closed-door meeting, whether you’re giving the bad news or the one receiving it. I won’t go into painful detail regarding the news of Washington Nationals reliever Drew Storen being optioned to Class-AAA Syracuse last night after a rough 24 hours that included battling the flu and an appearance against the New York Mets in a bit of a blowout which saw him giving up three earned runs and allowing two inherited runners to score in 2/3 of an inning that for all intents and purposes he had no business being a part of. To be honest, others have done a better job of explaining the gruesome details of Storen’s pitching performance that have sung out the S.O.S. that something was wrong, be it a mechanical flaw or otherwise. No, for once, I am going to set aside that statistics and just wax unpoetic about what comes next. OK, I can’t do it – I do have a couple of stats, I just can’t help myself; I promise to be brief. No matter who he is, how nice he treated your niece, no matter when or how he was acquired, when a player does not perform, very tough decisions must be made; these are especially tough decisions when he is one of the faces of your franchise and one of your much heralded first round draft picks. It stinks. Yet, from a strictly baseball performance and productivity perspective, two saves in seven opportunities stinks, as does the 14.40 ERA in blown saves. A 1.49 HR/9 from a guy who pitched 51% of his appearances in games where his team was either up by one run, down by one run, or tied in the seventh inning or later isn’t cutting the mustard. It doesn’t inspire confidence. …as well as a strikeout to walk ratio of 3.31 this season – a little over 3 for his career – all tell us something. What, exactly? Let’s start with the first table, which are Storen’s 2013 contact, zone, and swinging strike rates for his repertoire (thanks to Fangraphs). I don’t include his career rates in the table, but overall his 2013 rates are at or a little better than what he’s done over his career. In short, Storen’s ‘stuff’ is still good – he can miss bats and induce poor contact with his pitches. OK, sounds encouraging, let’s talk about the second table – his PITCHf/x pitch values per 100, or his pitch linear weights. While there are caveats to looking at this data and then running off with exorbitant assumptions being made by using these values, they are useful with the sample size we have with Storen. While I don’t lend much merit to his 2013 values as being the ground truth, I look at these values more broadly – there are more positive than negative values. The point? Storen has at least three, maybe four, MLB above average pitches in his repertoire. It doesn’t happen often, but there are situations where a guy like Storen – who spent has his entire collegiate and professional career as a reliever – can make the adjustment, get his arm stretched out, and become a starter. Hell, the Nats have a guy right now in AAA doing that exact same thing – Christian Garcia. While Mr. Garcia’s 2013 hasn’t been as healthy or productive as everyone had hoped, the fact he is down there and getting the chance to make the conversion from relieving to starting still bodes well for Storen. He is in an organization that still believes in him and is willing to let him make the change and redefine himself and his career. It’s never an easy road back to the bigs, but hopefully with some of the numbers presented here, a small silver lining has been provided in what has been a stormy 2013 for Storen. While the disappointment of 2012 may or may not still be looming over the former closer’s head, the ability to come back in a different role than the one that has defined his career and the public’s perception of his pitching talent could be panacea that everyone is looking and hoping for. On the other hand: Storen’s pitch selection has looked more and more like a starting pitcher this year than at any other time during his tenure with the Nats. They’re both fastball/slider/change-up pitchers. Scherzer seems to have developed a real curveball in the last two years–the emergence of which seems to have made his other pitches more effective, as well. Something to think about if and when Storen re-tolls. Thanks for your input as always, Ouij. I think Storen’s velocity won’t suffer greatly with a move to the rotation – my own thoughts here, but the difference between 95 to 93 isn’t as dramatic as 93 to 91 in terms of keeping hitters honest with your fastball velocity. Add to it his ability to get a LOT of misses with his slider and changeup and the drop in average velocity won’t be a huge concern – I still see him as a 8+ K/9 guy if he were to convert to starting. I love the Scherzer comp – LOVE him as a pitcher and love seeing him finally put it all together (that’s a lot of loves there by me). I see similarities with Scherzer as well as with Derek Lowe and Ryan Dempster, but with a higher ceiling and rotation slotting than Lowe and Dempster due to the velocity on his fastball. Not to toot my own guy’s horn here… http://nats101.com/2013/05/20/holding-court-now-playing-the-role-of-chris-sale-drew-storen/ But Court was beating this drum back in May. Now would be the time to try it if they were going to do that. No matter what happens, Storen needs to find his slider. It was too good of a pitch to forget. If the stiff-leg delivery was costing him velocity, then going back to the old “athletic” way might help the slider, as well as both fastballs. This could also compensate for losing a few ticks on the gun if he starts (plus I agree he can afford the loss – Sale lost about 2mph and got better). The Nats need starting depth for the stretch run. Now’s the perfect time to stretch him out. If it makes sense to us, maybe it will make sense to the FO as well.